Financial Additions has been pairing excellent candidates with the best organizations for the last 17 years. Specializing in Finance, Accounting, Audit and Tax positions, we work hard to find your team the perfect match. While we are based in the DFW area, our clientele spans across the country with national organizations seeking to fill various accounting and financial roles. Each Quarter we send out a survey to just over 1000 accounting professionals, HR departments, and executives across the DFW area. The goal of this survey is to see what predictions industry professionals have for the current job market, and how they expect their organization to react in the future. Currently, the DFW area is experiencing an unemployment rate that is almost a whole percentage point lower than the national average. According to the U.S. Bureau of Labor Statistics, the DFW unemployment rate for August was 4.10%, while the national average was up at 5%. This makes sense, as major corporations are moving to the Dallas area. Companies like Hyundai Capital and Jamba Juice have already moved while Toyota and Liberty Mutual are planning to move within the next six months. With that being said, companies across the metroplex feel that the accounting and finance job market will continue to improve, or stay where it is at. 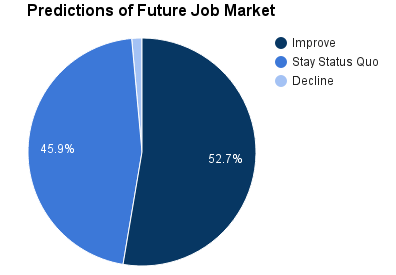 Only about 5% of respondents felt that the job market would decline in the future. Looking internally, over half of respondents said they plan on maintaining the same headcount at their organizations. 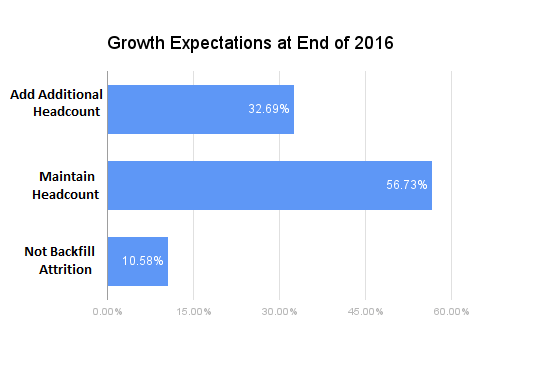 This demonstrates continued stability in the job arena, especially with nearly a third of respondents predicting adding additional headcount. For more interesting data and predictions from our survey, please check out the Market Survey page and fill out our contact form. We would be happy to reach out and supply you with more industry information!